on winning Ava’s triskelion “goddess” pendants by Anita Schultz Jewelweed Sprouts. I hope you love them like I love mine. I wear mine when I’m writing the Ava books, so I have it on a lot these days as I rewrite Ava’s 2nd star turn, in Stunner. I hope you wear yours while reading Bombshell. For those of you that didn’t win, you can write to Anita and ask for your own triskelion pendant, and I know she’ll make one for you. anita at jewelweed sprouts dot com. 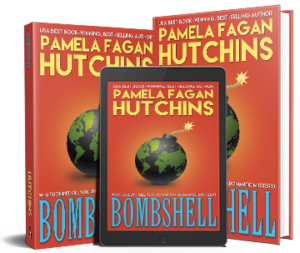 The links are all on the book pages, which you can access here: https://pamelafaganhutchins.com/publications/fiction. I’ve got a busy August—as much or more than I can handle—of personal and professional obligations. Judging a writing contest, rewriting Stunner, preparing for my role at Killer Nashville (panels and keynote), and the myriad other smaller items on my to-do list. Meanwhile I’ve battled a bout of giardia (must have gotten sloppy on water treatments on the camping trip!) My blog posts may be a little less stunning as a result, but hang in there with me. I appreciate the heck out of you guys! Many thanks for including me in this post, Pamela. You are the best! You are very welcome. I want to hear your name as a winner on August 26! Your name and mine. That would be awesome. You have had such a lot of great news and great things happening for you. (Aside from being bring sick, yuck). Go Pamela go! Thank you my love. You and the kids are my biggest blessings. Well, y’all and Katniss.